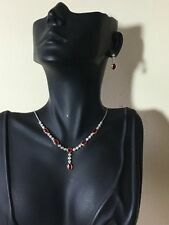 Ruby & Diamond Necklace & Earrings. Set with 27 Diamonds Totalling 1.62ct. VVS Clarity. Totalling 4.00ct. Weighs 10.87gr. Earrings Fully Hallmarked. Necklace stamped 750. Both Tested as 18ct Gold. Clearance Bargain - 2 Rings For Less Than The Price Of One New One! Thank you for taking a look at this clearance bargain, which comprises of a 2-tone 18ct gold 0.18ct genuine diamond engagement ring, together with a superb, 18ct white gold wedding ring. This is an opportunity to get both rings for less than the cost of buying one of these rings if they were new. ENGAGEMENT RING 18Ct solid yellow/white gold Fully British hallmarked 1 x 0.18 Carat Diamond - Good Si clarity / H Colour 3.5mm Diameter diamond Finger Size L Weight of Ring = 1.75 Grammes Fully British Hallmarked - Diamond Weight Stamped On Inside WEDDING RING 4mm Diameter Central Groove 18Ct White gold Fully British Hallmarked Weight of Ring = 4.44 Grammes. Lovely set in a knot design consists of a pair of stud earrings in yellow gold, rose gold and white gold with a butterfly fastening and a matching ring that is just yellow gold, with a plain gold band. THIS IS A STUNNING 14K GOLD 1.5 CARAT DIAMOND RING, EARRING AND NECKLACE SET. THE RING WEIGHS 4.9 GRAMS, THE EARRINGS WEIGH 6.1 GRAMS AN THE NECKLACE WEIGHS 5.1 GRAMS. ALL THE DIAMONDS ARE OF VS2 CLARITY AND G IN COLOUR. We try to provide boxes to suit the item. SIZING RINGS :9CT OR 18ct GEM SET RINGS. WE USE A SPECIALIST REPAIRER WHO WE HAVE BEEN SENDING RINGS TO FOR OVER 45 YEARS. THIS IS SAFE QUICK AND EASY. TO VIEW MORE CATEGORIES than is shown. 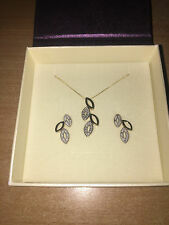 NEW 9CT GOLD DIAMOND LEAF EARRINGS & NECKLACE SET BOXED. Diamond Carat: 0.2OCT. Diamond: 100% Natural. 9 Carat Yellow and White Gold 20pt Diamond Leaf Earrings and Necklace Set. This is a beautiful 18ct two-tone gold necklace and bracelet set. Both pieces are made up of yellow gold and white gold links that are held by pins giving them a semi-rigid structure. The necklace has alternating arrow shaped links that follow all the way round whereas the bracelet has the arrow shapes but with squares between the opposing gold links. 10K ,12K AND 14K SOLID YELLOW AND ROSE GOLD, HALLMARKED, THE LEAVES AT THE FRONT ARE 10K & 12K SOLID GOLD. 14K YELLOW GOLD PLATED CHAIN, SPRING RING, 1.3 GRAMS - THE CHAIN IS NOT SOLID GOLD, THE EARRINGS AND PENDANT ARE SOLID GOLD HALLMARKED. Both earrings and bracelet feature a tear drop design that has a white gold center and a twisted wire border. Sabbadini is a very high end jewelry designer that started in the Milan fashion district of Italy and has found its way into the heart of Manhattan. A Gift That Will Leave Her Awestruck ! 1 Necklace, 1 Pair Earrings, 1 Authenticity Certificate. Necklace Earrings Set. Natural Diamonds & Natural 4.57 Cts Ruby. Natural/Synthetic Diamonds. Our QUALITY can't be beat ! This is such a nice set of jewelry. The 10K yellow and rose gold pierced earrings have diamond cut heart design with a brushed yellow gold finish and a rose gold flower. The pendant has a shiny yellow gold finish with rose gold flower. Gorgeous, Unique Two-Tone White and Yellow Gold Diamond Earrings and Ring Set. Design Features Internal Yellow Gold Band with External White Gold Casing Covered in Diamonds. Total Diamond Weight = 1.00 ct.
A Gift That Will Leave Her Awestruck ! 1 Necklace, 1 Pair Earrings, 1 Authenticity Certificate. Necklace Earrings Set. Natural Diamonds. Natural/Synthetic Diamonds. •Custom Jewelery Designing - We Can Manufacture Your Jewelery Design. 14kt Two-tone Gold His & Hers Round Diamond Solitaire Matching Bridal Wedding Ring Band Set 1-1/5 Cttw. 14kt Two-tone Gold His & Hers Round Diamond Solitaire Matching Bridal Wedding Ring Band Set 1-1/5 Cttw. Perfect Gift For All Occasions ! 1 Diamond Necklace, 1 Pair Diamond Earrings, 1 Authenticity Certificate. Necklace Earrings Set. Natural Diamonds. Natural/Synthetic Diamonds. Our QUALITY can't be beat ! Perfect Gift For All Occasions ! 1 Diamond Necklace, 1 Pair Diamond Earrings, 1 Authenticity Certificate. Necklace Earrings Set. Natural Diamonds. Body & Design Features. Natural/Synthetic Diamonds. The two pieces are perfectly matched and make an elegant pair with their very fine quality diamonds. Material:Solid 18k Yellow and White Gold. Item Details (Necklace). Item Details (Bracelet). Stone(s):(74) Natural Genuine Diamonds - Round Brilliant Cut - Prong Set - G Color - VS2/SI1 Clarity. A Gift That Will Leave Her Awestruck ! 1 Necklace, 1 Pair Earrings, 1 Authenticity Certificate. Necklace Earrings Set. Natural Diamonds. Body & Design Features. Natural/Synthetic Diamonds. •Custom Jewelery Designing - We Can Manufacture Your Jewelery Design. 1 Necklace, 1 Pair Earrings, 1 Authenticity Certificate. Necklace Earrings Set. Natural Diamonds. Natural/Synthetic Diamonds. Our QUALITY can't be beat ! Price May Vary. Model Number. Body & Design Features. Akoya cultured. Regarding quality, these pearls display lovely silvery-rose overtones, and have the characteristics of the AAA and AA pearl strands in that they have excellent luster, very thick nacre and exhibit clean surfaces even though their shapes are free form. Akoya cultured. Regarding quality, these pearls display a lovely silvery-rose overtones, and have the characteristics of the AAA and AA pearl strands in that they have excellent luster, very thick nacre and exhibit clean surfaces even though their shapes are free form. This is an amazing pure 14kt Yellow White Gold 10-6mm Diamond Cut 4 Open Loose Oval Shiny Double Open Oval Link Two Tone Fancy Necklace and bracelet with Lobster Clasp. This classic and very elegant item, making for a simply amazing piece of jewelry. This is an amazing pure 14kt Yellow White Gold Shiny Marquis Oval Oval Link Bracelet & Necklace. This classic and very elegant item, making for a simply amazing piece of jewelry. We stand behind our product. 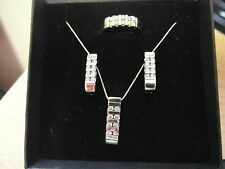 14ct Necklace,Earring,Bracelet Set. Set comprises of Necklace ,bracelet & Earrings in 2-tone 14ct gold and encrusted with cubic zirconia gemstones set in white gold. Necklace 18". Weight 32.4 g. Bracelet 7 1/2 ". The earrings clutch are tested 9ct gold and are stamped 375 as you can see in the photo. chain is also 9ct solid gold and is stamped 375 as you can see in the photo. everything is 9ct real gold. (not fake). The band is solid 14k yellow gold and the center setting and prongs are solid 14k white gold. The head can be changed to incorporate different size and shape diamonds or gemstones. On either side of the center mounting is a 0.12 carat, bezel set, princess cut diamond with excellent clarity and color. Unique fancy 18ct gold necklace and earring set with rose and white gold pendant / drop features. We can make any jewelry in14K Gold ,18K Gold or950 Platinum and in all colors and color combinations. All of our jewelry issolid gold. Nothing Less than the karat weight as advertised! 14K White & Rose Gold. We can make any jewelry in14K Gold ,18K Gold or950 Platinum and in all colors and color combinations. All of our jewelry issolid gold. Nothing Less than the karat weight as advertised! 14K Solid White and Rose Gold. ESTATE 18K WHITE & YELLOW GOLD RING. BAGUETTE & ROUND DIAMONDS ARE G/H COLOR, VSSI CLARITY. 40 CARATS, 6MM WIDE. RING IS SIZE 4.75. CAN BE SIZED BY OUR MASTER JEWELER. CENTER SETTING CAN FIT 7MM (1.5 CARAT) DIAMOND OR GEM. So much nicer in person!Any dark discoloration you see is just the photo's and not the ring! Hallmarked: 18k Mars. Accent Diamonds: 54 Round Natural Diamonds. Founded in 1979, we have grown to be the most respected, trustworthy jeweler in Charlotte and surrounding! ESTATE 14K WHITE & YELLOW GOLD RING. FEATURES BAGUETTE CHANNELS AND TRILLION SIDES. DIAMONDS ARE G/H COLOR, VSSI CLARITY. 51 CARATS. RING IS SIZE 7.25. CAN BE SIZED BY OUR MASTER JEWELER. CENTER SETTING CAN FIT 5MM PRINCESS DIAMOND OR GEM. 14K Two Tone Gold. We can custom make this ring to fit any size and shape diamond. Will hold a 0.75-1.00 Carat Round Diamond. We can make any jewelry in14K Gold ,18K Gold or950 Platinum and in all colors and color combinations. 14K White & Rose Gold. We can custom make this ring to fit any size and shape diamond. Will hold a 0.50-0.65 Ct Round Diamond. We can make any jewelry in14K Gold ,18K Gold or950 Platinum and in all colors and color combinations. ESTATE 14K WHITE & YELLOW GOLD RING. DIAMONDS ARE G/H COLOR, VSSI CLARITY. 48 CARATS. RING IS SIZE 4.00. CAN BE SIZED BY OUR MASTER JEWELER. CENTER SETTING CAN FIT 1 CARAT ROUND DIAMOND OR GEM. WRITTEN APPRAISAL SERVICE AVAILABLE. ESTATE 18K WHITE & YELLOW GOLD RING. BAGUETTE DIAMONDS ARE G/H COLOR, VSSI CLARITY, 1.64 CARATS, 6MM WIDE. RING IS SIZE 6.00. CAN BE SIZED BY OUR MASTER JEWELER. CENTER SETTING CAN FIT 12MM x 8MM (3 CARAT) DIAMOND OR GEM.